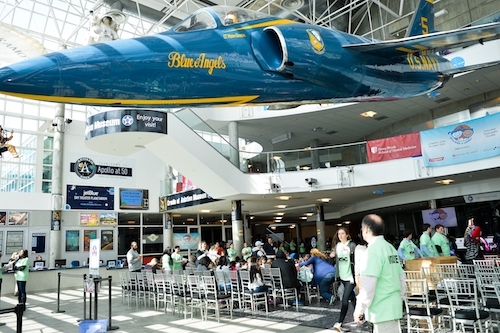 March 2018 - The Stony Brook School of Dental Medicine (SDM) provided free dental care to hundreds of children at the annual “Give Kids a Smile” Day event hosted by the Nassau County Dental Society at the Cradle of Aviation Museum in Garden City. In total, over 1,200 children between the ages of 4 and 8 received free dental screenings, cleanings, and gifts from more than 100 dentists, dental residents and students, and hygienists. Stationed in front of the museum’s entrance, the SDM’s Mobile Oral Health Services Clinic offered its three dental operatories to help facilitate comprehensive oral exams, including a fluoride varnish. SDM faculty members Drs. Rhona Sherwin and Marcie Lebovic, pediatric residents Drs. 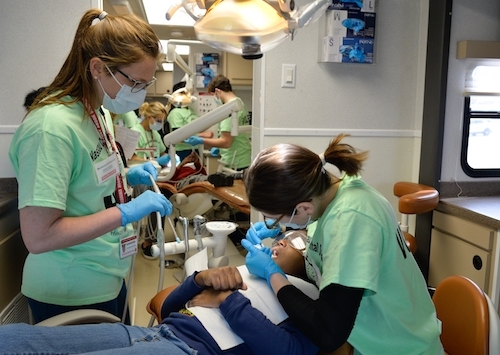 Kelly Kreckl and Ella Skoler, dental assistant Heather Mills, and Year II and Year III dental students smoothly coordinated and provided dental care within the dental mobile clinic to dozens of children from local school districts. Beyond the “Give Kids a Smile” Day event, the Mobile Oral Health Services Clinic, or mobile dental clinic, presently visits six family homeless shelters and five school districts, providing oral health community programs and dental services to improve the oral health of underserved children throughout Long Island. In addition, services are provided at 17 Early Head Start and Long Island Head Start facilities. According to Dr. Sherwin, Director of Pediatric Outreach for the SDM, “Community involvement is at the heart of The Stony Brook School of Dental Medicine.” The presence of the mobile dental clinic, “provides needed preventive treatment to those children who face barriers to accessing dental care,” she added. For the first time in the event’s history, children with physical disabilities attended and received care. Fellows from the SDM’s Dental Care for the Developmentally Disabled (DCDD) program, Drs. Roxanne Clarke and Debleena Dash, provided screenings, cleanings and fluoride treatments to the group of excited first-grade students from The Henry Viscardi School, a K-12 school for children with severe disabilities. SDM’s Fellowship Program for DCDD was recognized in 2017 by the National Council on Disability as being one of two dental school programs in the United States that have “shown themselves to be leaders in providing education and experience” and go beyond the “assessment requirement of training their students” in the treatment of people with intellectual and developmental disabilities (I/DD). The School of Dental Medicine’s DCDD program allows for direly needed treatment of the I/DD population within its Dental Care Center at the SDM and at Stony Brook Southampton. “The School of Dental Medicine aims to continue to expand the reach of its DCDD program into the community in order to provide much-needed services,” said Dr. Debra Cinotti, Program Director for DCDD. 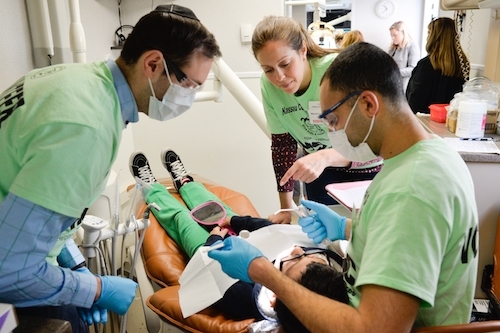 “The Stony Brook School of Dental Medicine welcomed the opportunity to care for children from the Henry Viscardi School for the first time at this year’s ‘Give Kids a Smile’ event,” added Cinotti. In addition to receiving important oral health care, children at the “Give Kids a Smile” Day event took part in museum tours and educational puppet shows and received goody bags with educational materials, crayons and coloring books, stickers, toothbrushes, and toothpaste. Mr. Met and the Farmland Fresh Dairy Cow also greeted the children in the midst of kid-friendly entertainment, including television screens and music. “We are proud to partner with our colleagues in Nassau County,” said Dr. Sherwin of Stony Brook’s participation in the annual “Give Kids a Smile” event at the Cradle of Aviation. The Stony Brook School of Dental Medicine hosts its own “Give Kids a Smile” Day event annually at its Dental Care Center. Free screenings, cleanings, fluoride treatment and teeth sealants are provided on site to hundreds of children each August.